You are here: Home / artist to artist / What Do We Owe to History in Our Art? What Do We Owe to History in Our Art? In my professional work as a museum exhibit developer – the content person on an exhibit design team – my job is to make the public believe we owe history, at least, the recognition of history’s reach. I’m complicit in how museums build narratives of public history through edited stories, selected objects, and exhibit themes that filter history through a specific lens. In my own, memoir-based writing I’m trying to integrate my parents’ experiences as Holocaust survivors into an understanding of my own life. In some ways, children of survivors are like museums. We are repositories and interpreters of history, and we feel responsible for housing the remembrance of traumatic events that happened to our loved ones in another time and place. The question of what I owe the survivors and the dead, even just my family members, let alone strangers, is central to my writing. I wonder, if by placing narrative themes over my family’s experiences – even trying to use the conventions of history museums to interpret how trauma filters through generations – if I’m honoring the past or exploiting it, illuminating history or distorting it. I’m not certain what I owe history, but it sure has its claws in me. We owe it to history to tell its hidden stories. In March 1971, International Women’s Day marchers turned left on Pearl Street in Cambridge, Massachusetts, and took over a Harvard University building at 888 Memorial Drive, declaring it a Women’s Center. Left on Pearl depicts a little known but highly significant event in the history of Second Wave feminism. The ten day building occupation by hundreds of women highlighted the hopes and triumphs as well as the conflicts and tensions within the Women’s Liberation Movement of the late 1960s and early 1970s, and led to the establishment of the longest continuously operating community Women’s Center in the U.S. I was surprised by how much I didn’t know about this period – the fact that help-wanted ads were segregated by gender, that a woman could be fired from a job for being pregnant, and that she couldn’t get credit or open a bank account without her husband’s permission. These things changed because of the hard-fought battles waged by Second Wave feminists, the granddaughters of the suffragists. Marginalized by backlash, those First Wave feminists were unable to transmit their history to the next generation. Second Wave feminists did not have access to this buried history until they began to uncover it for themselves. As a filmmaker, I see Left on Pearl as part of a larger effort to preserve our history and pass it on to the next generation. I don’t think art owes anything to history but I do think that artists who choose to create historically-based art should try very hard to be accurate to the time they are seeking to envision, just as at some level all artists should seek to find and illuminate the reality of the world that surrounds them today. To me good historical art is like a marriage with one partner history and the other art. As in any good marriage both partners need to be equal and meeting the needs and desires of both is a challenge that often requires creating a delicate balance between the two. All art should transcend time by getting at what is the essence of the human experience. Often this starts with the very specific: we seek to find what is true in our own place and time and then explore what transcends our moment to become universal. Historical art needs to also explore a third space – the historical time period being recreated. It needs to truly and completely honor the way people spoke, dressed, moved, thought and felt in that time – without any of our own contemporary concepts about those experiences. Before we can transcend any time – present or past – we need to truly and completely live in it. I often use memory and storytelling in my work. 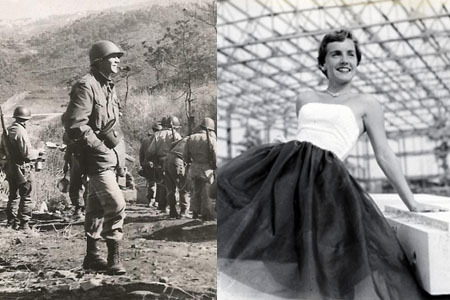 Unforgettable: Letters from Korea, my latest play, is based on love letters my parents wrote while my father was an infantry platoon commander in Korea and my mother was a senior at UCONN. While certainly an homage to them and their love, the play is also an exploration of the disconnection between a soldier’s battlefield experience and those who are left behind on the home front. Last summer we had the honor to perform Unforgettable for a group of Korean War Veterans in D.C. I have to admit, it was intimidating. What do we owe history in our art? Well, when history is sitting in front of you in the audience, you owe them quite a lot! We fretted over the details of the production from dog tags to C-rations, but what really concerned me was getting the story right for them; we wanted the vets to recognize their own stories in the story of these two young people. “You told it like it was,” was the comment that we got over and over after the show. We realized that, although the landscape and personalities of war change, the disconnection between peace and war – home and the battlefield – continue. Read more. Sari Boren will read at the Four Stories reading series in Cambridge on June 11th. The night’s theme is: Revisionist History: Tales of Recollections, Misremembering, & the Past. Susan Rivo’s documentary Left on Pearl will launch a crowdfunding campaign in September to raise finishing funds. Sign up for the project’s e-newsletter to keep in the loop. James David Moran, along with overseeing public programming at the American Antiquarian Society, is also a writer, playwright, director, and producer. Susan Thompson is a core member of Pilgrim Theater Research and Performance Collaborative. The troupe plans to bring Unforgettable back to D.C. this summer to perform for the 60th Anniversary of the signing of the truce between North and South Korea. What do YOU believe artists owe to history in their work? Leave a comment and join the discussion. Image: the parents of Susan Thompson, subjects of her play UNFORGETTABLE: LETTERS FROM KOREA. Images courtesy of the artist. “Heaven within the mountain points to hidden treasures. In the words and deeds of the past there lies hidden treasures that men may use to strengthen and elevate their own characters. As a Chautauqua performer, it is a delightful challenge- combining the historic facts about a woman with the emotional drama that brings her to life. I have chosen to present Margaret Bourke-White, famous photojournalist, mostly as she saw herself. During the Q&A I share additional insights into her life and her character crediting her biographer, Vicki Goldberg and others who knew her or worked with her. Letters from Eleanor Roosevelt, Amelia Earhart, Ansel Adams and others help to flesh out the presentation. Portraying a woman from the past is my art; research is on-going. For years women were barely a footnote in history books. Now they are receiving attention from teachers and professors at all levels, from books, from role models in every field, and from presentations like mine.